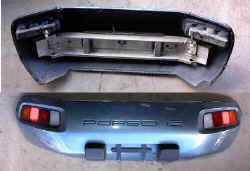 $65 Used GENUINE PORSCHE PARTS 2x 928 645 425 00, 2x 928 645 426 00 and 2x 928 645 428 00. 2 Large Rear Interior 1/4 Panel Speaker Grill surrounds with grills plus 2 extra surrounds for each side. 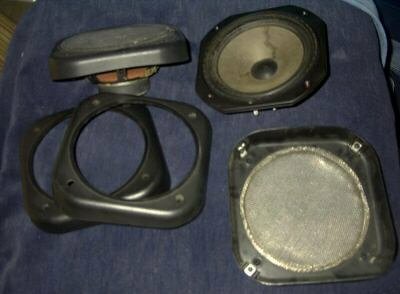 Add to that the two speakers that go with it and the mounting hardware to bolt the speakers inside the grills. The surrounds are in good shape, but a few cracks and nichs are evident. Still they are as good as most you will find, and these are hard to find now. Speakers work perfectly. No rips or degradation. They put out good original sound as from the factory. 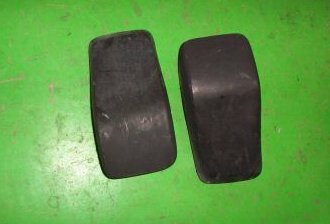 Bumper Guards, Rear, 928, Set 618 $80 Pair of large rear rubber bumper impact protectors that were removed from an 84 928S coupe. They are in reasonably good condition. Brake Pad Sensors, 928, '78-'82 601 $8 NOS, price is per sensor. I believe these are aftermarket, though they are tagged with a Porsche part number on each. I believe this will work for 80.5-90, but it came from an '87. The climate control unit is Part #928.573.060.09. 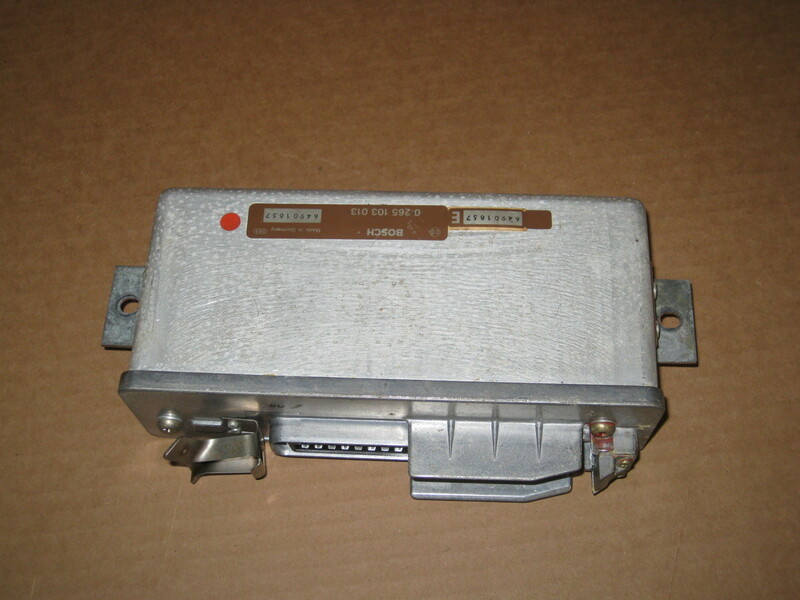 Also includes the warning lamp unit, Part #928.641.609.14. If you only want one or the other, make me an appropriate offer. 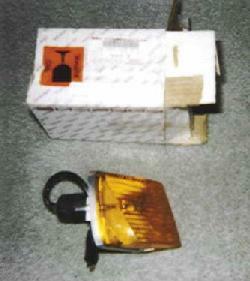 The CCU has sold, but the warning lamp unit is still available for the marked price. Sunvisor, 928, Pair 600 $35 Used set of 2 928 Burgundy Front Sunvisors in very good working condition, fit 1978-1995 928, 928S, 928S-4 and GTS series cars. Great replacement for existing cracked or broken visors. ABS Brake Controller, 928S, '86 579 $150 Porsche 928 ABS Brake Controller, complete, from '86 928S. Spare Light Bulb Kit, 928, 1979 577 $20 Emergency Light Bulb Kit from a 1979 928. Appears to be in very good condition, however I'm not sure if all the bulbs/fuses/etc. are present. $95 From an '84 928. Includes the piece that connects it to the dash. Air conditioning worked perfectly (according to the person who sold it to me) before the car was wrecked. The dash-mounted portion alone runs $80 new at retail! 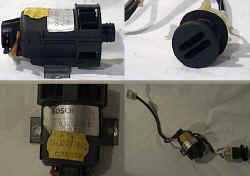 I believe the assembly here consists of the following main parts: 928.624.113.01 (sensor - seen at >$100.00 online), 928.624.041.00 (sensor part that mounts on dashboard, seen at >$80 online), 928.573.527.02 (connecting piece, seen at $2+) and 928.573.344.02 (sealing ring, about $1.00). 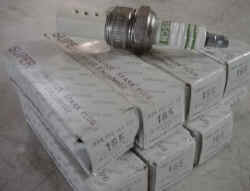 Sparkplugs, 928/924 560 $16 Brand new, never used 928 Spark Plugs, OEM, in original packaging. A couple popped out of their boxes when the lame shipper I bought them from threw them into a bag and dumped them in the mail, but I checked and they look fine - you might want to double-check the gap on them in case they pinged something (I couldn't see a problem - they still have the cardboard protectors on, but I didn't use a gauge), but other than that are perfect. 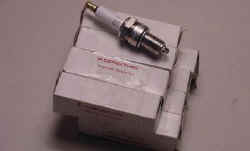 Sparkplugs, 928/924 554 $34 Numbers on these plugs are: 14R-7DU , R6 850 and the Porsche Part # is 999 170 156 90. This is a set of (8) eight OEM plugs, originally obtained for my 1986.5 928S. The plugs are marked Beru ultra and box is marked Porsche Genuine Parts. Person these were purchased from claimed they will also fit the 924 but ask me to double-check that if you're interested for that application. The current dealer price is $6.39 each I believe. These have never been used or out of the box except to photograph. 928/968 Alternator 514 $80 Used alternator removed from Porsche 968. 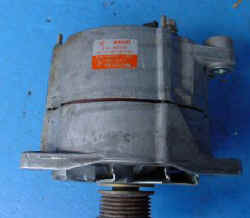 Porsche part number: 928 603 011 04. This is Bosch part # 0 120 468 006. The label also says: N --> 14V 40/115A. I had this tested by a local shop, and it passed. The one defect I do see is the plastic part where the leads attach is broken such that the 'guides' through which the wires pass is missing. I can show you a detail photo if you'd like, the shop said this should have no effect on the functioning of the alternator. The leads will still attach properly, just the plastic guide channels are missing. 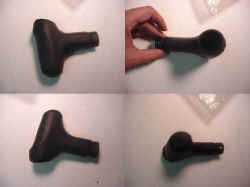 $185 This is a new OEM Porsche automatic black leather shift handle. This fits the 928 1983-1984, 944 1982-1985, 924S 1986-1988. 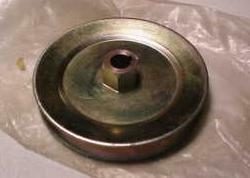 The factory Porsche part number is 928426077001AJ. 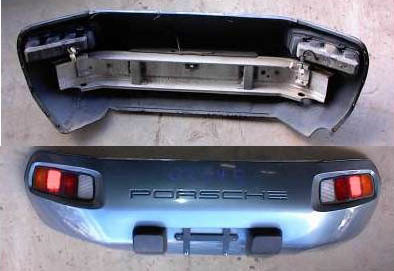 Rear Bumper Assembly, 928S 453 $300 Rear bumper with taillights and inner rebar from 1984 Porsche 928. Very good condition, still has correct shape. All it needs is sanding and painting. Bumperettes and license bracket too! Taillights look good but each has a small crack in the back border running from a screw hole to the outside, should be easy to repair - have to look close to see them. Fits 1978 thru 1986 Porsche 928. Shipping may take some working out as I'll probably have to palletize it. 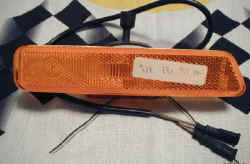 Note: the right taillight assembly is not included, as I plan on using it myself. If you would like it as well, though, let me know! 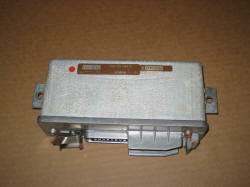 928 Front Marker Assembly, Left 78-86 428 $22 100% Complete. New would run about $40 or more. Part #928.631.411.02. 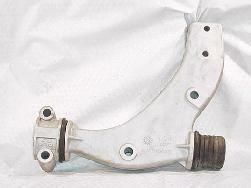 928 Rear Wiper Arm 420 $28 Used, came off '79 car. Rubber isolator blocks in bad shape and wrapped in Scotch tape so they don't fall off, not sure if salvageable. Needs new refill. 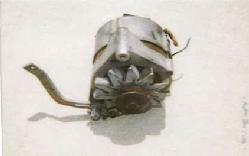 928/944 Alternator 394 $200 Rebuilt (New old stock) Porsche 928 alternator fits 1992-1995 5.4 L 1985-1991 5.0L also fits Porsche 944 1985-1991 OEM# 0-120-468-001 Bosch Reman#AL170X. 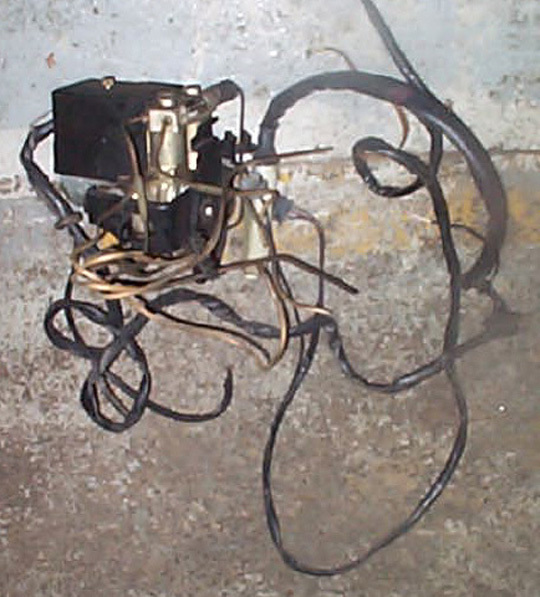 Includes pulley. 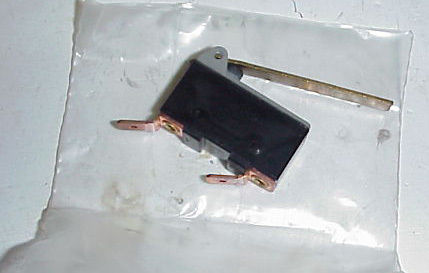 928 Thermostat 364 $20 This is a NEW Porsche 928 Thermostat. This thermostat fits the 928 1978-1990. 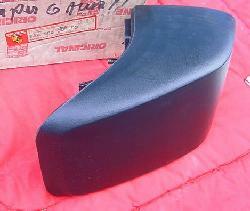 928 Rear Seat Cargo Bin 344 $47 This is a NEW OEM (though a bit dusty) Porsche 928 rear seat package/cargo box. This new factory piece fits the Porsche 928 1978-1995. Note that this is the lower half only, in case yours is broken (the latch area usually is what goes). Part #163g would go well with it! 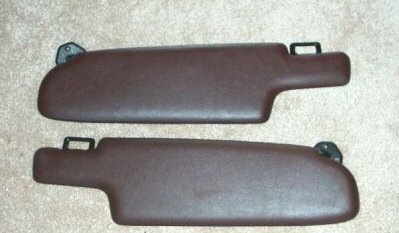 928 Rear Bumper Guards, '78-'86, Pair, NEW 284 $140 New, in spotless condition. No longer available from the dealer, they can still be gotten used , but these babies are brand spanking NOS! The factory parts department decals are still on them. 928S and 928S4 (Rear letters), Various colors $10 Come in same colors as item above.. These sell for $26.50 in one major aftermarket catalog. 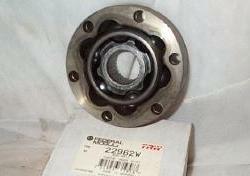 928 87-on, 944S/T 87-88 Outer Wheel Bearing, Front 342 $7 each Part #999.059.089.01 new in box. 2 in stock. 928 Rod Bearings??? $20 each I believe these are 928 Rod Bearings, .50mm over, but you should check the part number carefully. It is 928.103.143.57. I have three sets, all in their original boxes. Price is per set, but make me an offer for all three. 928 Alternator 155 $52 Highly suspect. Fan scrapes against housing, suggesting bad bearing. Also, during shipping, the person I bought this from did not pack it very well, and some of the electrical parts on the back got damaged. Sold as is, price is what I paid for it. 928 Wiper Arm 163w $18 Wiper arm is in okay condition, doesn't have the little rubber 'shock absorber' between the arms. The wiper itself is pretty lame, definitely needs a new insert. 928 Belts $20 4 belts, Part #s 999.192.120.50, 999.192.266.50, 999.092.286.50, Napa 25-10283. Not sure yet what the Napa one is, but the others, in order, are: a 1980-1982 928 Water Pump Belt, a 1985-1988 Alternator Belt and a 1985-1988 Power Steering Belt. Bottom Seat Support 163b $15 This is the little plastic piece at the base of the seatback. It is Navy Blue and in mint condition. 928 Upper Radiator Hose $10 Used.Part #928.106.239.07. Comes with one of the clamps - the other end has developed a slight bulge, but otherwise, this hose looks to be in good shape. I believe this came from an '86 928S. 928 Carpet Piece $5 A (currently) unknown piece of navy blue 928 carpeting. Porsche Heated Side Mirror $55 This mirror appears unused (no scratches on the connectors) and bears part #911.731.035.09. I was going to use it for a driver's side mirror, but when I found it had 'OBJECTS IN MIRROR ARE CLOSER THAN THEY APPEAR' I decided against it. From the sticker on the back, I am assuming it was manufactured on Feb. 24, 1995 - it appears more modern than the heated mirror on my 1980 911SC, but I believe it should work fine for the following models: 911 1976-86, 924 mid-1978-82, 924S, 944 1983-early 85, and 928 1978-86, left or right. Part #911.732.035.08, which I believe this is a replacement for, sells for $84.98 in Automotion's catalog. Now $400! Porsche OEM wheels for 1986.5 928S, need repainting, otherwise in great shape.